Every time I hear this one, I cringe. It’s so patently and obviously false that it took me awhile to realize that it needed an article. But with the recent events in D.C., Texas, and now North Carolina, I’ve been seeing meme after meme on social media touting this argument as a fact. Nothing could be farther from the truth. 1. Pro-life legislation is leading the charge to protect women. After the shocking discoveries at the disgusting Gosnell clinic, pro-life leaders have been leading the fight to make sure that Gosnell will never happen again. For instance, in Texas now, proposed legislation would require abortion clinics to meet the same standards as other outpatient surgical clinics. Other states, like Louisiana, have passed legislation banning the dangerous practice of webcam chemical abortions, where no actual doctor examines the patient. Some states, learning from Gosnell, have passed new laws or have begun to reinforce their existing abortion clinic regulations, ensuring that dangerous practices are not slipping through the cracks. All of these measures will make abortion safer for women by holding the people who perform them responsible for maintaining the same standards of basic care that other medical professionals a required to uphold. 2. Crisis pregnancy centers and maternity homes help women and children in need. I had the privilege of visiting an amazing Woman’s Care Center in Indiana recently, and there are many similar centers all over the country. Not only do they provide counseling to women experiencing crisis pregnancies, but they also continue to care for the woman once she chooses life. Some centers have the resources to provide prenatal medical care and have employee or volunteer doctors and nurses; others help women apply for state benefits to ensure they get the care and nutrition they need. Many of them have a points system, where expectant mothers attend classes that teach them about parenting issues such as lactation techniques, proper discipline, nutrition, and basic care standards. When they attend classes, they earn points, which they can use to “buy” the things they need for their babies – food, cribs, clothes, toys, and more. They also help set up adoption for those women who are not ready or able to be mothers. Similarly, Maternity Homes house women in need and give them the resources they need to become good mothers. 3. Data appears to indicate that pro-life people are more generous. 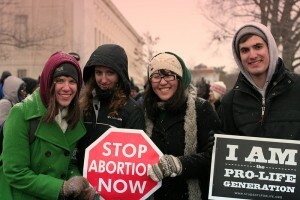 According to Gallup, 66% of those who consider themselves “conservative” are also pro-life. This comes into the argument when you look at studies that show that conservatives are more likely than their liberal counterparts (73% of which are pro-choice) to give to charities, donate a larger percent of their income to charity, volunteer more often, and give blood more. Since a large majority of conservatives are pro-life, it is safe to assume that most pro-life people donate or volunteer at elevated ranks as well. There are many other ways that many continue their pro-life ministry, including personally adopting children, or being foster parents like President Ronald Reagan, Governor Sam Brownback, and Representatives Michele Bachmann and Tim Huelskamp, among others. Some may volunteer or donate to soup kitchens, homeless shelters, children’s homes, and many other charities.